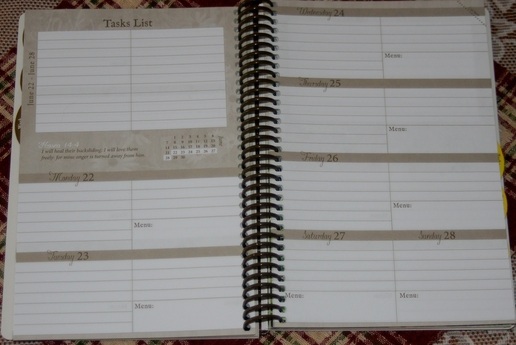 As a busy wife, mom, writer and speaker I am always on the lookout for a great planner. In the digital age when everyone has an app for that I still would rather reach for a physical calendar. 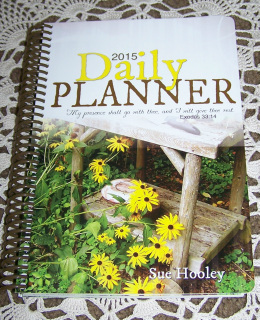 I had the privilege of reviewing Sue Hooley’s Daily Planner through CWA. What I love about this planner is that it’s so much more than a calendar. Yes, it has a yearly, monthly as well as weekly calendars included, but there’s so much more. There are beautiful scriptures nestled within the pages to give you encouragement throughout the year. Towards the back of the planner there are sections for tasks and projects. This is a great place to put all your long term tasks around the house or school projects for the kids. It allows you to keep track well in advance so you don’t wake up to, “Mom, my science project is due tomorrow and where’s my costume for the school play?” Sue has included an information section to keep track of names, addresses and phone numbers. All these features are great, but my personal favorite would have to the shopping list section at the back. Each page has three perforated sections. These are a perfect size for making certain you don’t forget items on your next shopping trip. I would highly recommend you order the 2015 Daily Planner. It would also make a great gift for the “planner” on your Christmas list.